I’m pretty sure that pirates did not carefully craft deviled eggs while they were out to sea raiding merchant ships, but somehow the sound of “Devil Me Eggs!” struck a chord with me and so I’ve taken poetic license with the title of this post. I love deviled eggs. But then, who doesn’t? Me being me though I tend to start experimenting and so we’ve been enjoying all kinds of deviled eggs here in the UnDiet kitchen. For your eating enjoyment I’m posting some of our fave recipes below. Oh, and since I’m working on a series of low carb cookbooks the recipes below are all 0 carb. Yes, that’s right, I said it – 0 carb! Even though it seems simple enough to boil an egg, if not done correctly you’ll spend a lot of time peeling off teeny-tiny bits of eggshell and end up with a pock-marked egg white. After much trial and error I’ve found one way (I don’t say “the way” because I’m sure there are other ways to get a good result) to boil an egg for easy peeling and with a fully cooked yolk. Place the eggs in a pot large enough to hold them in a single layer. Cover the eggs with cold water and bring to a full boil over high heat. As soon as the water boils, turn off the heat, cover the pot, and let the eggs stand for 15 minutes. Drain the water off and fill the pot with cold water. Set aside until the eggs are cool. I like to do this in the morning or the day before as there’s nothing worse than staring at a pot of eggs waiting for them to cool. Well, there are worse things, but I still don’t like waiting for eggs to cool. It’s easy for the chickens, they lay an egg and the yolk is right there in the middle. We cook the eggs, remove the yolks, mash them with a fork and then stand there perplexed as to how to get them back into the whites. You can of course spoon it in, but that usually ends up in a yolky mess. Thanks to the multi-purpose plastic bag it’s actually quite easy to present a beautiful deviled egg to family and friends. Place the yolk mixture into a plastic bag and twist to push the mixture into one corner. Cut off the tip of the bag in that corner. Push the yolk mixture towards the hole to pipe into the whites. With all of the extras added to the filling you’ll most likely have extra egg yolk mixture left after filling the egg whites. You can use this filling to fill celery sticks, spread on a cucumber or radish slice, spread on a slice of meat and fold or roll up, or use as a sandwich spread. Once you’ve made the deviled eggs, stick a toothpick in several of the eggs and cover loosely with plastic wrap so that you don’t flatten the filling. The toothpicks will keep the plastic wrap from touching the filling. Refrigerate for 30 minutes to allow the flavors to meld. 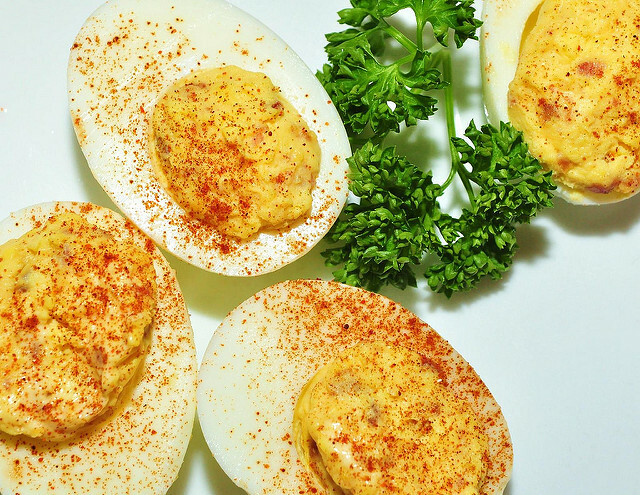 Store deviled eggs in a single layer in an airtight container in the fridge. Serve deviled eggs within two days of making. After the second day, they won’t taste quite as fresh. If you have any deviled eggs still left at that point, mash them up, add some fresh ingredients such as cucumbers, tomato or fresh herbs and use them for sandwich filling. For those of you who are watching your carbs, you’ll need to add the carb count for these extra ingredients. In a medium mixing bowl combine the crabmeat, celery, mascarpone cheese, mayonnaise, sour cream, Dijon mustard, lemon juice, and chives. Season, to taste, with salt and pepper. With all of the extras added to the filling you’ll have extra egg yolk filling left after filling the egg whites. You can use this filling to fill celery sticks, spread on a cucumber or radish slice or make a sandwich with a 1 Minute Muffin or 1 Carb Protein Bread. Carefully remove the yolks from the whites, placing them in a small bowl. Use a fork to mash them together with the remaining ingredients until the mixture is smooth. Fill egg whites with mixture. Dust with paprika if desired. With all of the extras added to the filling you’ll have extra egg yolk filling left after filling the egg whites. You can use this filling to fill celery sticks, spread on a cucumber or radish slice, spread on a slice of meat and fold or roll up, or make a sandwich with 1 Carb Protein Bread. Carefully remove the yolks from the whites, placing them in a small bowl. Use a fork to mash them together with the mayo, mustard, salt, pepper and parsley until the mixture is smooth. Stir in shrimp & bacon if eating right away. If not eating until later in the day or the next day, reserve bacon to sprinkle on top. Fill egg whites with mixture. Dust with paprika, cayenne pepper or chili powder. To the egg yolks, add the sour cream, mascarpone cheese, mayonnaise, lemon juice, chives, salmon, salt, and pepper. Beat with a fork or mixer on medium speed until fluffy. Fill the egg whites with the egg yolk mixture. I know that not everybody is up for a truffled egg, but I love, love, love, love, love, love, love, LOVE truffles. If you’ve never tried one I strongly encourage you to try something, anything, flavored with real truffles, if not an actual truffle. And if you’re going to have truffles, eggs are the perfect thing to have them with. Remove the yolks from the eggs. Mash yolks, mayonnaise, truffle oil and cayenne together until smooth. Mix in chopped jarred black truffles, if using. Spoon into the egg whites and top with chopped chives. If the idea of eating green eggs and ham has your mouth watering and you just can’t wait until you can get to the store and pick up some fresh herbs, you can substitute, chives, lettuce, carrot tops or beet tops for the herbs. You can use any type of avocado, but if you’re concerned about carbs, the Haas avocado is significantly lower in carbs. Don’t ask me why, I have no idea, I just know that it is so. Mash egg yolks, avocado, mayonnaise, Dijon mustard, chopped mixed herbs, chopped garlic, and salt and pepper. Divide among the egg whites. Crisp 3 slices prosciutto in a skillet; crumble over the eggs.